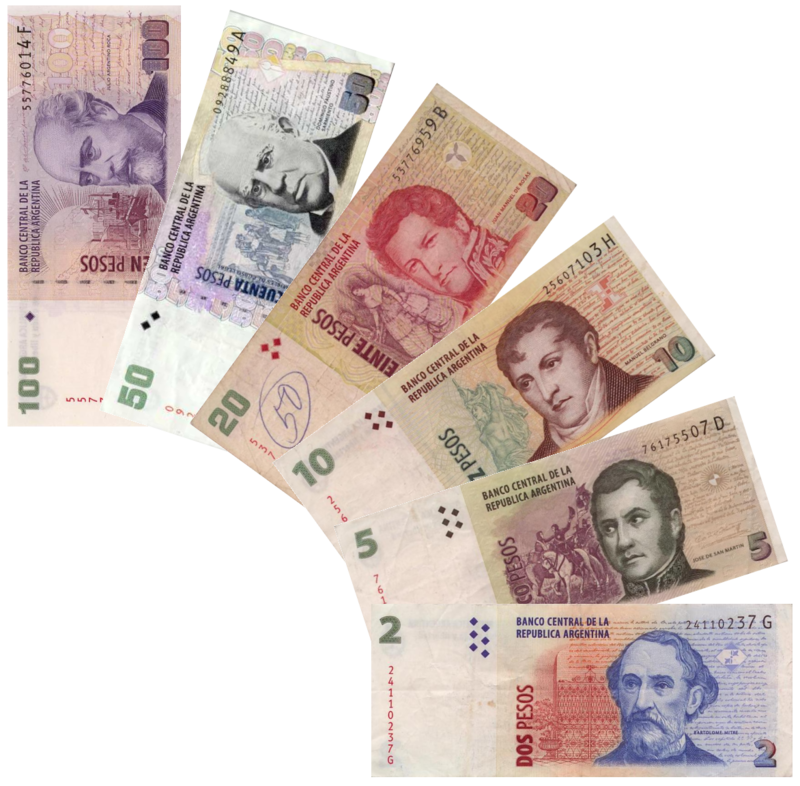 The amount of currency in circulation in Argentina is just over $300 billion pesos, and it is comprised almost entirely of six different denominations of bills, as show above (coins are essentially worthless and hardly ever seen). According to the Argentine Central Bank, about two-thirds of all the currency in circulation is of the $100 peso variety, with the other third spread between the five smaller denominations. If my experience here is any guide, it is rare to see a $2 bill, and the occasional $5 bill is, in practice, the smallest denomination that most people are able or likely to use. Ironically, the smallest denominations are the hardest to come by, and when you do see them they are so frayed and flimsy that many of them are held together by scotch tape. To put this in perspective, $100 pesos today is worth about $8 dollars (US) on the black market, and about $11 dollars at the "official" rate. Imagine how it would be if consumers in the U.S. were limited to buying things in increments of 40 cents ($5 pesos), and if the largest bill available were worth less than $10. My friend (the one whose daughter got married yesterday) today told me that in order to pay for the wedding and all the people involved, he had to disburse an amount of bills (most things are still paid for in cash here) that would fill almost two shoeboxes. It's become almost comical, and reminiscent of the stories of hyperinflation we have all heard when people had to use wheelbarrows to carry enough currency to pay for daily expenses. Why are things so crazy? 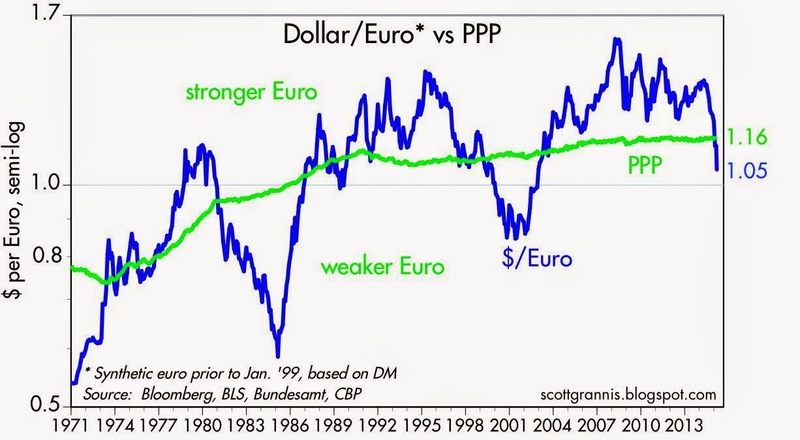 For one, it's the inevitable result of a classical monetary inflation. But it's also because the government doesn't want to officially recognize that inflation has been running at 25-30% for the past six years—printing larger denomination bills would be equivalent to legitimizing all that inflation. That's silly, of course, since you can't cover up an inflation that is fundamentally driven by an almost 30% annual increase in pesos in circulation (see chart above) over the past six years by printing tons of small-denomination bills. Prices are going up at a significant pace, and it doesn't matter what denomination the bills have. In an attempt to remedy this idiocy, an opposition politician recently proposed a law that would create bills of $500 and $1000 pesos. The government will certainly oppose this measure, but eventually it will pass in some form or other because otherwise the average citizen will need a huge wad of currency in his or her pocket just to make it through the day. Meanwhile, a $100 peso note will buy you a sandwich and maybe a Coke. For us Americans it's not so bad, since $100 pesos will also get you a decent bottle of wine in most restaurants, or even a decent steak. And despite the inflation, Argentines are wonderfully nice people and the food is terrific. There's a way to judge whether monetary policy is likely to pose a threat to economic growth, and I lay it out in this post. It involves looking at the real Federal funds rate (using the Interest on Reserves that the Fed pays as a proxy), the real yield on 5-yr TIPS, and the slope of the nominal and real yield curves. If overnight real yields are high (>3%), if they exceed the real yield on 5-yr TIPs, and if the nominal and real yield curves are flat or negatively sloped, then monetary policy poses a clear and present danger to the economy. By these standards, monetary policy currently poses little or no risk to the economy. The risk of recession is consequently very low for the foreseeable future. Today's market action suggests that the market has been excessively concerned about the threat of monetary policy. That reinforces my long-held belief that the market still has a healthy amount of risk aversion, and is therefore not over priced. When judging the impact of monetary policy on the economy, it's important to remember that the level of nominal short-term interest rates is far less important than the level of real short-term interest rates. For example, 10% nominal interest rates are far less burdensome in a world of 10% inflation than in a world of 1% inflation. 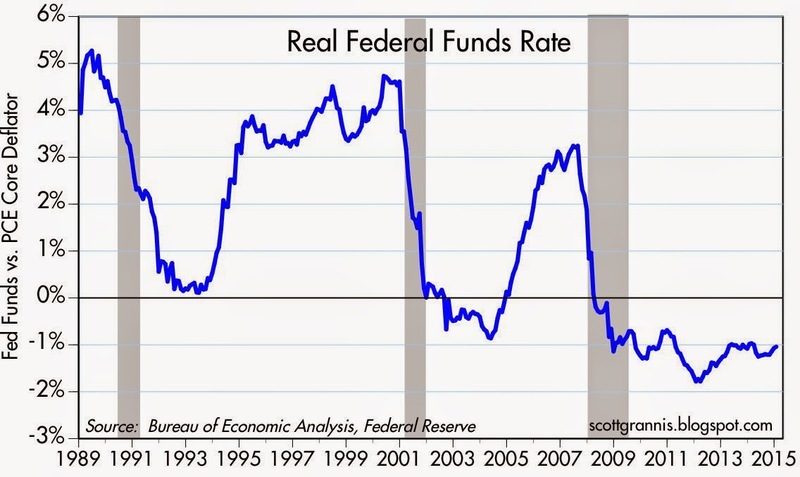 The FOMC in the past has stated clearly that although its main monetary tool/target is the overnight Fed funds rate, what it is really targeting is the real overnight Fed funds rate. When they want to slow the economy and/or bring inflation down, the FOMC raises real short-term rates; when they want to "stimulate" the economy the FOMC seeks to lower real short-term interest rates. 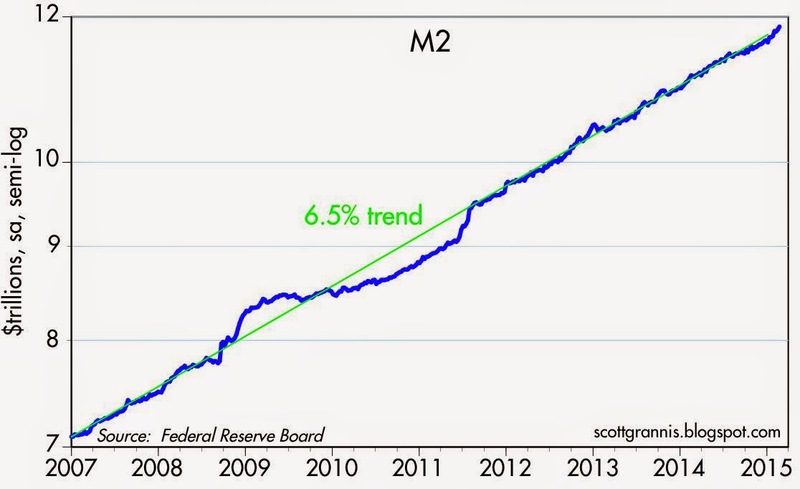 As the chart above shows, the real Fed funds rate has been negative for the past seven years, and is currently about -1%: the difference between the 1.3% year over year rise in the PCE Core deflator, the Fed's preferred measure of inflation, and the interest rate paid on reserves of 0.25%. So the Fed's primary policy tool is the real Fed funds rate, and that determines the risk-free yield for the front end of the real yield curve. The market's assessment of the future path of the real Fed funds rate is what determines real yields across the maturity spectrum; that in turn is a function of Fed guidance and the market's view of the future strength of the economy and the direction of inflation. If the market expects the Fed to raise real short-term yields over time, the real yield curve will be upward sloping; if the market comes to believe that the Fed will begin to reduce short-term real yields, then the yield curve flattens and eventually inverts. Fortunately, the real yield on TIPS (which are default free and inflation-protected) is a handy, liquid, and market-based indicator of the expected future path of the real Fed funds rate. In my opinion, TIPS are one of the most under-appreciated of all economic and financial indicators. 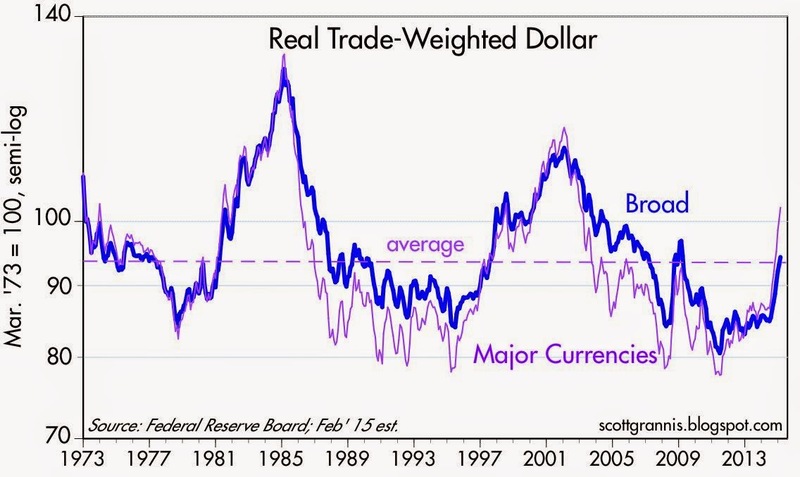 As the chart above shows, it is the combination of the level of the real Fed funds rate and the market's perception of the future direction of real yields that can tell us volumes about the health of the economy. 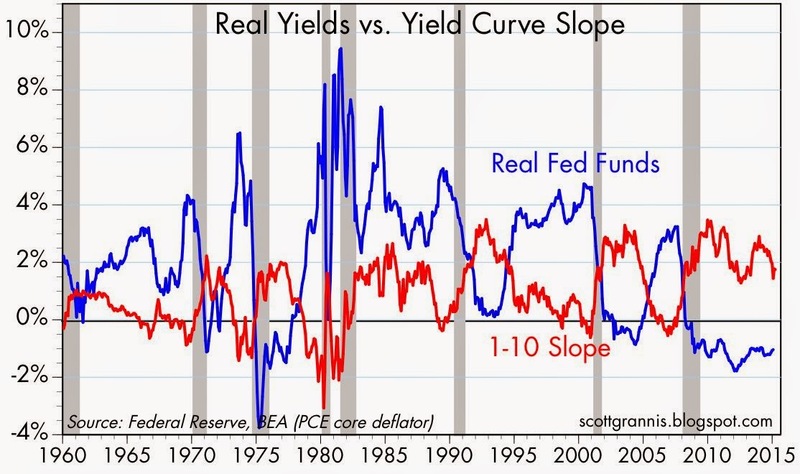 Every recession in the past 55 years has been preceded by a significant increase in the real Fed funds rate (blue line) and a flattening or inversion of the yield curve (red line). When the market begins to sense that the Fed will eventually need to reduce real short-term rates (i.e., when the yield curve flattens and/or inverts), that is the time when monetary policy has finally begun to weaken the economy, and that in turn will force the Fed to respond with a reduction in real interest rates. Today, the real overnight rate is very low and both the nominal and real yield curves are positively sloped, so the risk of recession or even an economic slowdown is minimal, according to this model. 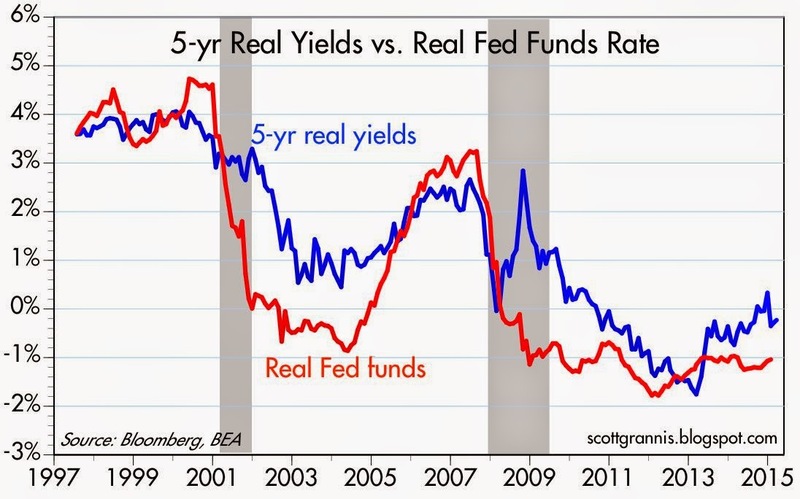 The chart above compares the real Fed funds rate to the real yield on 5-yr TIPS. When the real yield on 5-yr TIPS is higher than the real overnight yield, as it is today, the real yield curve is by definition positively sloped, which means the market expects that the Fed will be raising rates for the foreseeable future. It's when the real yield curve becomes inverted (when short-term real yields equal or exceed 5-yr real yields) that monetary policy becomes a threat to the health of the economy, because a flat or negatively-sloped real yield curve tells us that the market senses that the Fed can no longer raise rates and will soon have to lower them in response to a weakening economy. That (an inverted real yield curve) happened prior to both of the last two recessions, and at a time when real yields in general were much higher than they are today. Once again, the conclusion is that monetary policy today is not even remotely a threat to growth, nor is there a significant likelihood of an economic slowdown or recession. Using the past as a guide to the future, we ought to start worrying about Fed policy only when the real Fed funds rate rises significantly and starts to approach or exceed the real yield on 5-yr TIPS. Today, that means the Fed could raise the interest rate it pays on reserves by 50 or 75 bps without threatening the health of the economy. The Eurodollar futures market says the Fed won't raise its target rate by that much until about a year from now. If by that time the economy has gathered a bit more steam and/or real TIPS yields have increased, then even a 0.75% or 1% Fed funds rate a year from now (which would equate to a real Fed funds rate of -0.5% or -0.3%) shouldn't be a problem at all. Monetary policy would still be "easy." 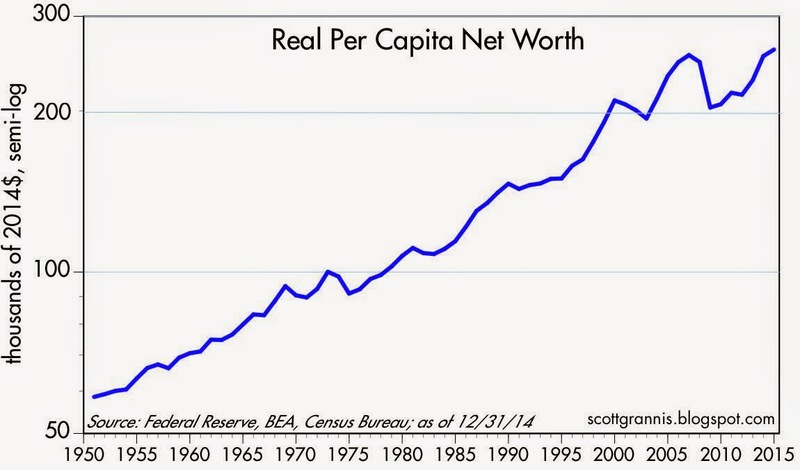 For investors, this strongly suggests that cash and cash equivalents are an inferior asset class. Yields on almost all other asset classes are substantially higher, and likely to remain so for the foreseeable future because of the low risk of an economic slowdown or recession. February housing starts were much weaker than expected (897K vs. 1040K), but the weakness is quite likely to prove temporary. The drop in starts last month was probably weather-related. Builders' sentiment suggests that conditions are probably slowly improving. 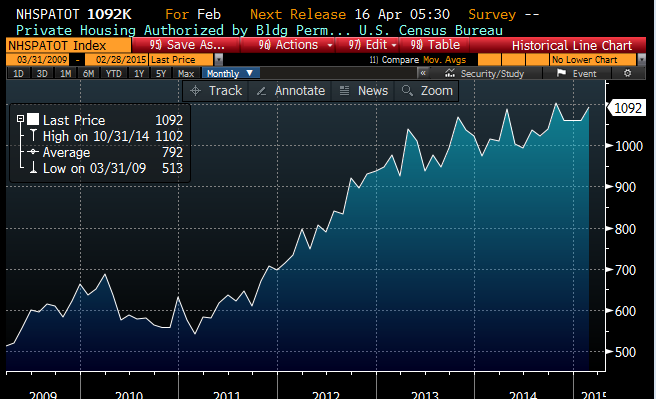 The chart above shows February building permits, which are still trending higher. 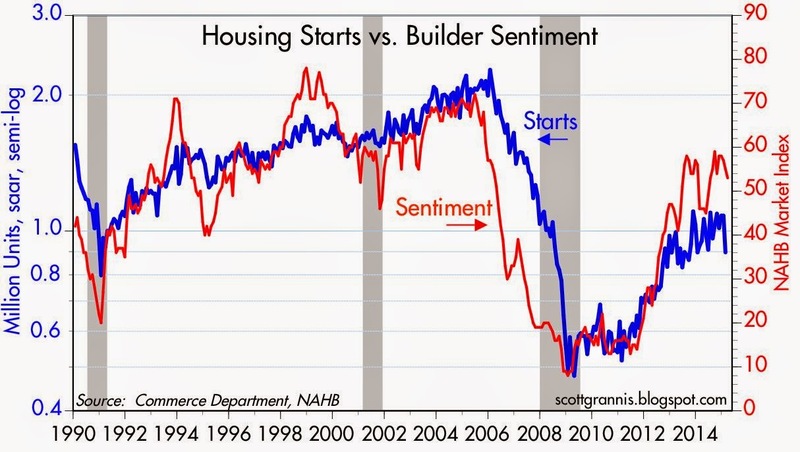 This corroborates the slowly improving trend in builders' sentiment. Permits lead starts, so we'll likely see starts picking up in the months to come. There is plenty of upside potential in the housing market. 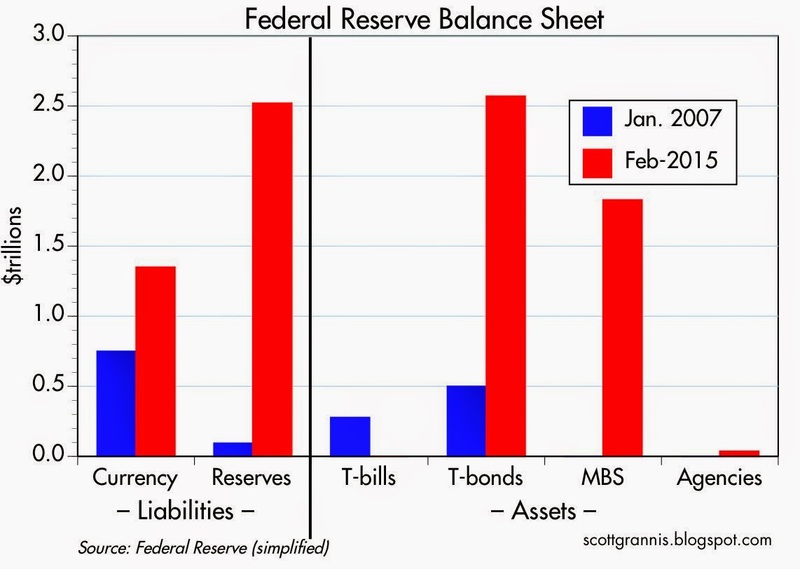 The blue bars represent the Fed's balance sheet in January 2007, well before the financial crisis of 2008 erupted and Quantitative Easing began. 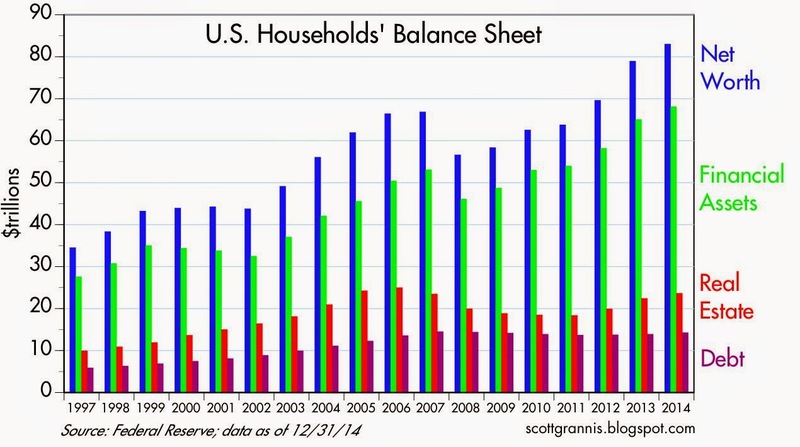 The red bars represent the Fed's latest statement of its balance sheet, which can be found here. I've simplified things considerably (e.g., I've not included reverse repo agreements and other miscellaneous liabilities), but the story remains the same. 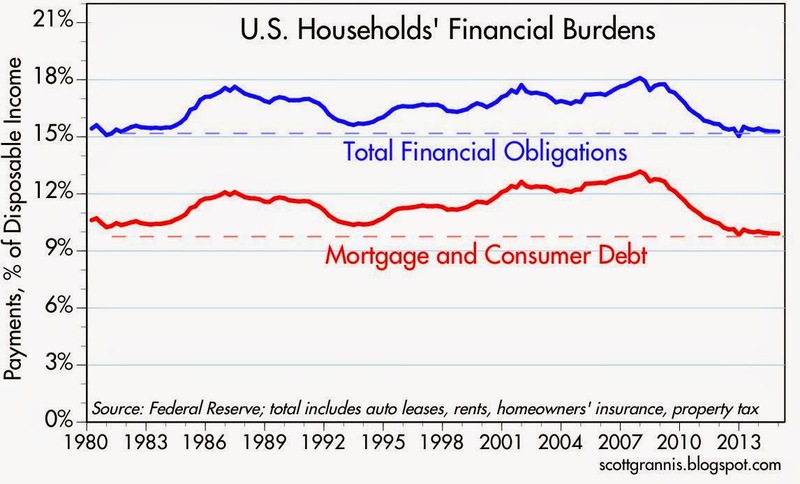 The left portion of the chart represents the Fed's liabilities, while the right side represents the Fed's assets. At the end of the day, the Fed's purchases of notes and bonds were offset by an increase in the Fed's liabilities, most of which are bank reserves (and the majority of those are considered to be excess reserves) and the rest currency in circulation. The Fed effectively transmogrified most of the notes and bonds it purchased into reserves (which are functionally equivalent to T-bills, since they are default free, short-term in nature, and pay a floating interest rate). The banking system has been happy to hold those reserves; rather than lending out the flood of savings deposits (almost $4 trillion since late 2008), banks have preferred to lend the money to the Fed in exchange for reserves. 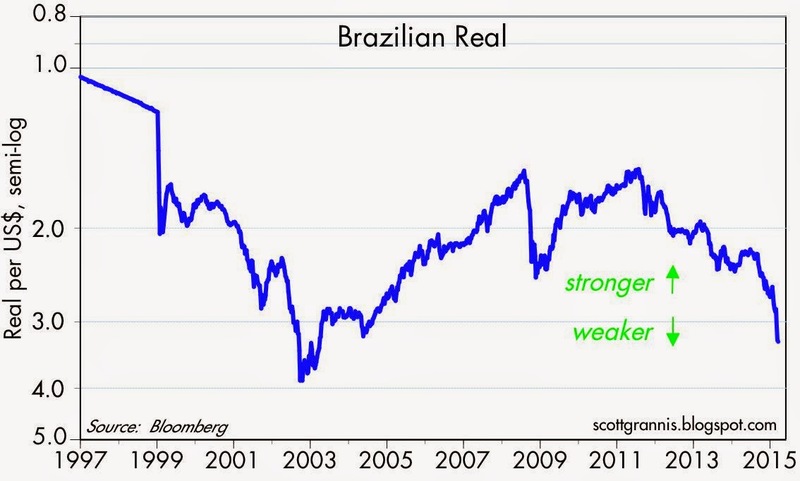 Note: The increase in currency since 2007 was not "printing money" in the way that Argentina has freely printed money. 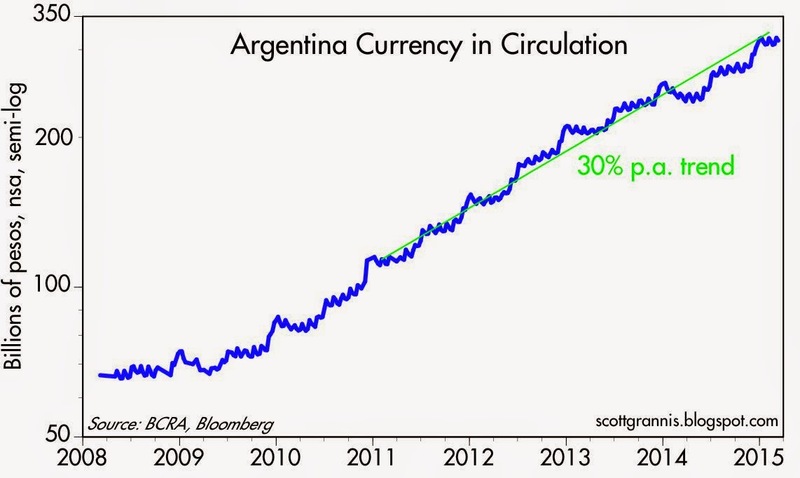 In the U.S., unlike in Argentina, currency in circulation represents cash that the public wants to hold. In Argentina, the central bank prints up lots of currency which it then "lends" to the government in order to pay bills and benefits. Newly printed cash floods the economy—nobody wants to hold all that extra cash—and pushes up prices in the classic inflation definition of "too much money chasing too few goods." Also of note is that the majority of U.S. currency in circulation is held outside the U.S. by people who actually want to hold it. If the world did not want all that currency, it would be returned to the banking system in exchange for short-term deposits. The news and the economic fundamentals haven't changed much in recent months, but on the margin there has been some modest improvement. 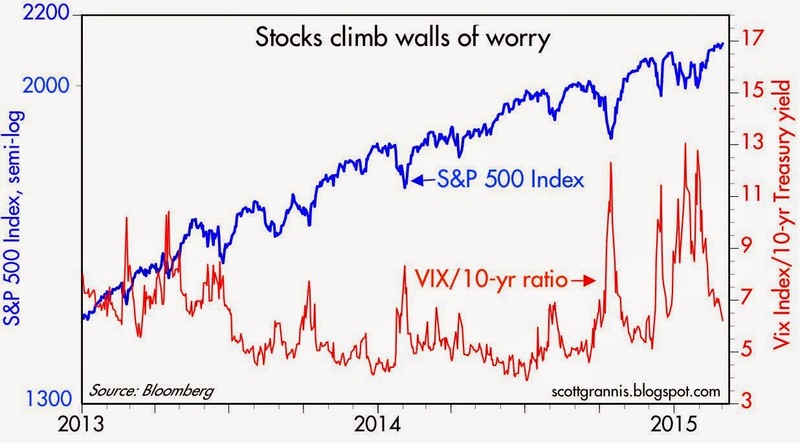 The following charts highlight some of the more interesting developments that bear watching. 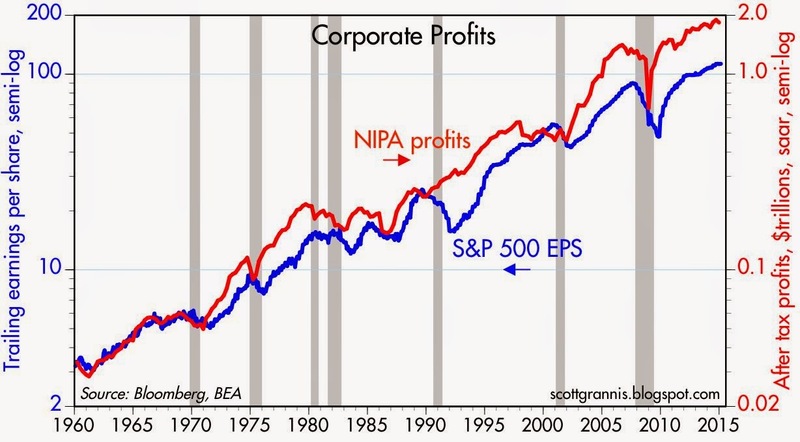 Rising profits have been the source of most of the gains in equity prices in recent years. 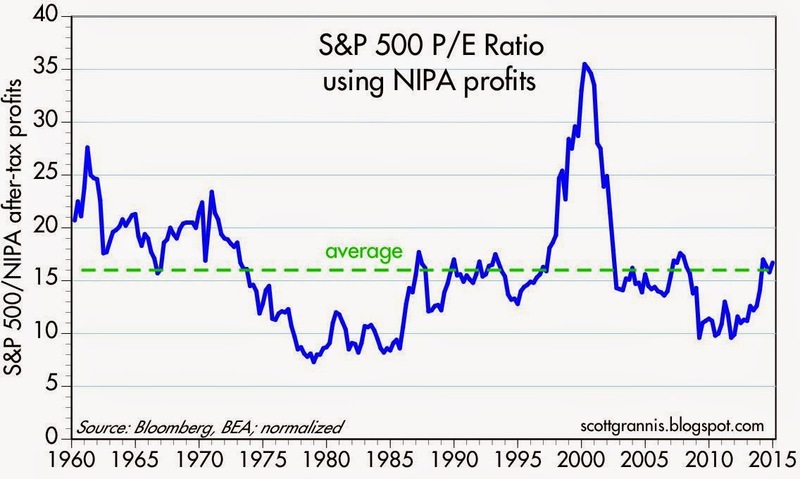 Since the post-recession low in PE ratios (13.9 in August 2010), ratios have increased by 35% to almost 19 today. Over the same period, earnings have increased almost 50%. 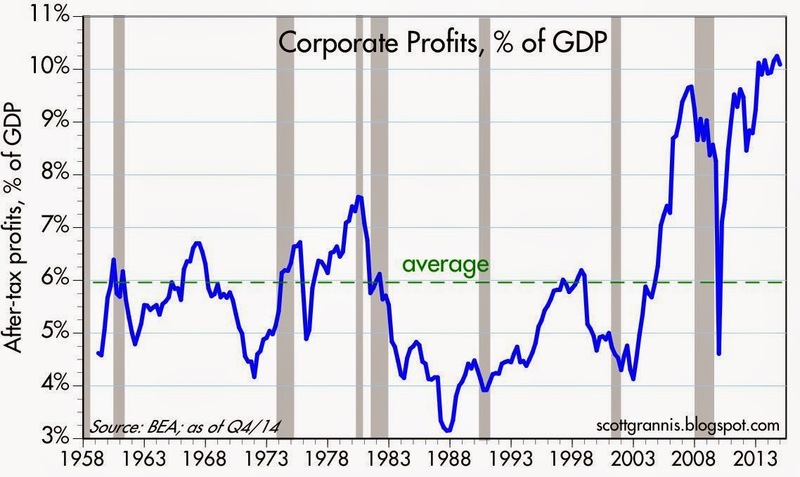 However, profits growth has declined in the past year, with S&P 500 trailing earnings up only 4.4% in the past 12 months, thanks in part to falling oil prices. Fortunately, that's not exactly a bad thing for everyone. 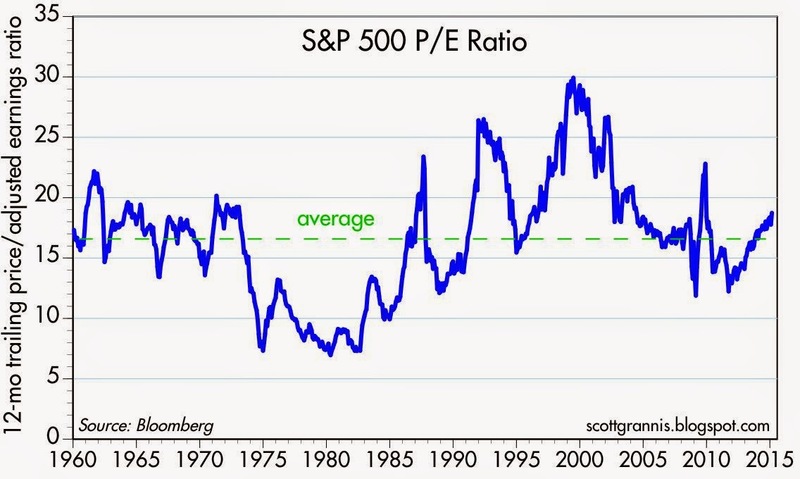 PE ratios are above average, but not by a significant amount. 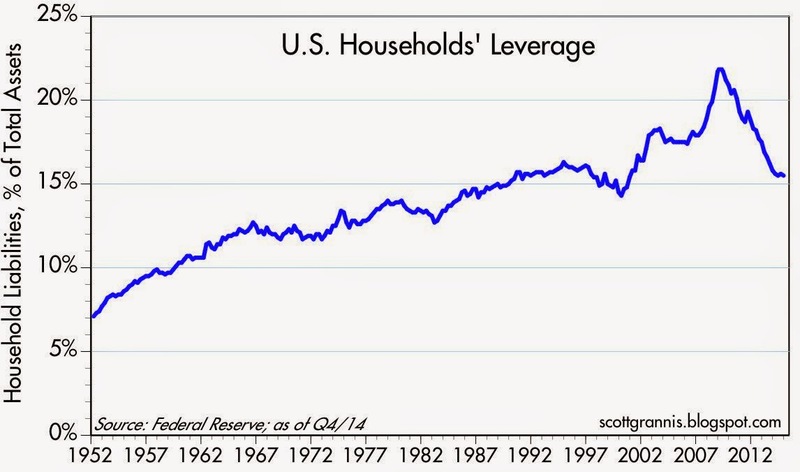 I remain fascinated by the chart above, which I've been following for the past few years. 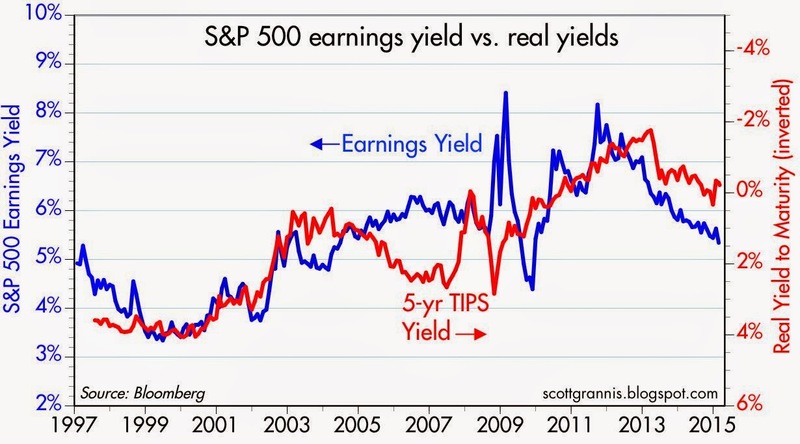 It shows a decent correlation between the earnings yield on equities and the price of 5-yr TIPS (using the inverse of their real yield as a proxy for their price). When earnings yields are high and real yields are very low, that is a sign of a market that is very risk-averse: investors don't trust earnings, and are willing to pay very high prices for the safety of TIPS. Risk aversion has been declining for the past few years, however, as confidence slowly improves. This is a significant trend that is likely to continue. 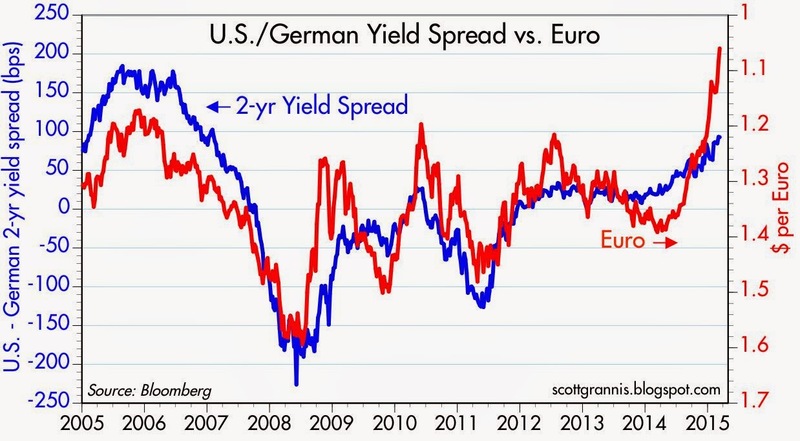 Expect higher PEs and higher real yields over time. Equity risk premiums (defined here as the difference between the earnings yield on stocks and the yield on 10-yr Treasuries) have come down sharply from their October 2009 highs, but remain relatively high by historical standards. The earnings yield on stocks today is still substantially higher than the yield on safe Treasuries. That's another sign of risk aversion: in a strong, growing economy like we had in the 1980s, investors are typically willing to give up yield (i.e., accept a lower earnings yield on risky stocks than the yield on safe Treasuries) in order to benefit from a rising equity market. Today, investors still demand a higher yield on risky equities because they are still somewhat risk averse. 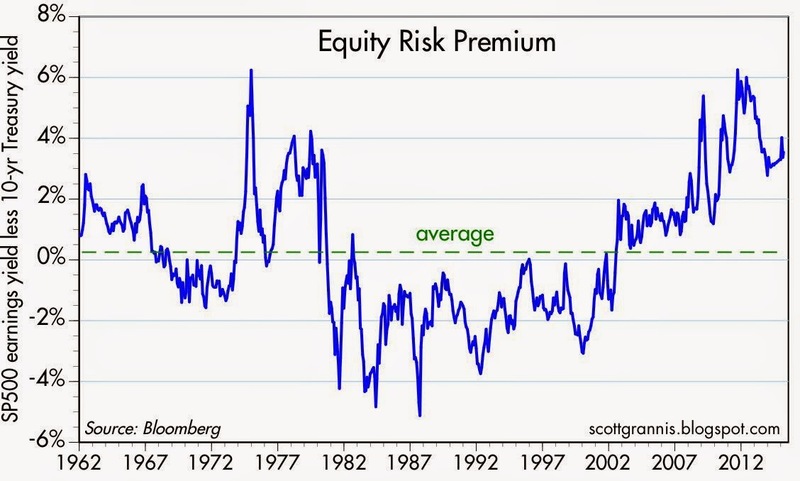 Today's relatively high equity risk premium is reminiscent of the high equity risk premiums that prevailed in the late 1970s, when investors were reeling from the shock of double-digit inflation, a weak dollar, and soaring Treasury yields. Today's investors are still reeling from the shock of the Great Recession. 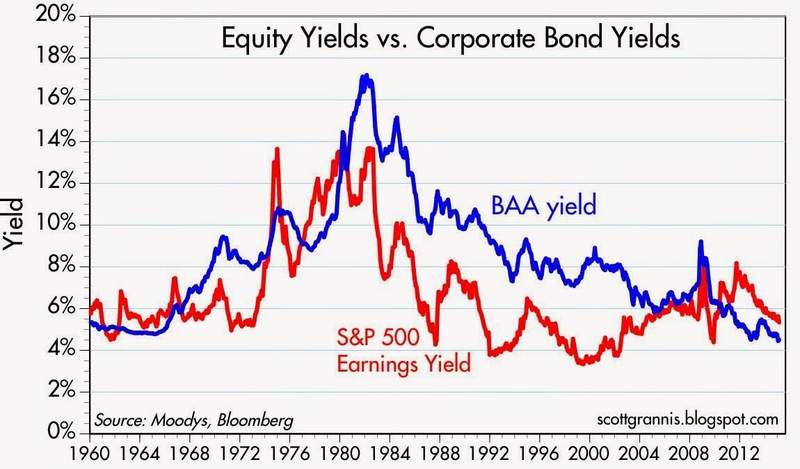 Earnings yields on stocks are still higher than the yield on BAA corporate bonds. This is relatively rare, since corporate bonds are higher in the capital structure. In a "normal" world, equities should have lower yields than corporate bonds, since equity investors are willing to give up yield in order to benefit from the expected growth of earnings. 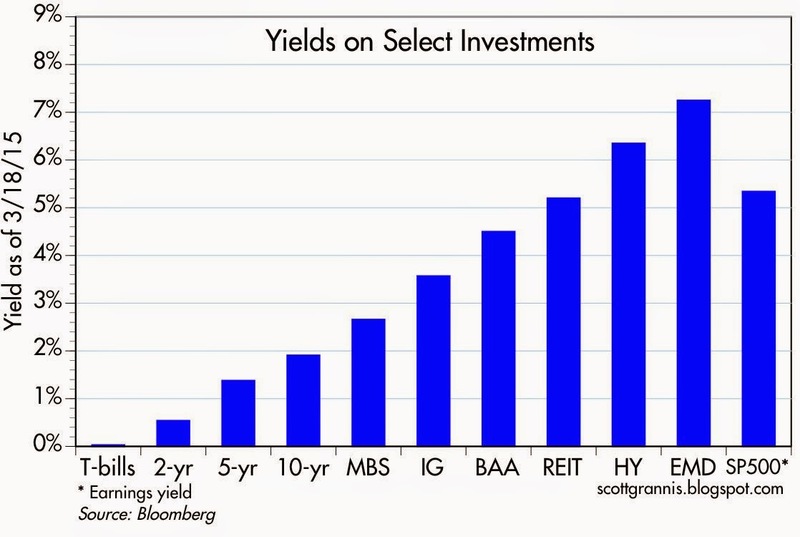 Bond investors, on the other hand, are willing to give up price appreciation in exchange for a higher and safer yield. 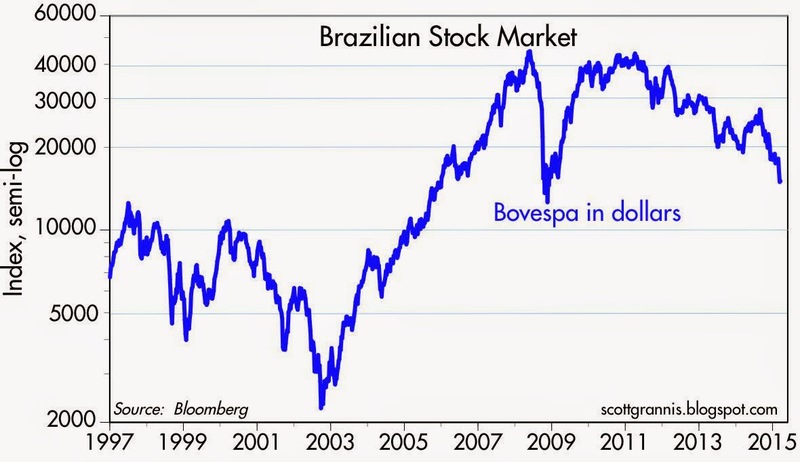 Today, however, investors are unwilling to pay up for equities, in a sign that risk aversion that still prevails. I wouldn't be surprised to see equity yields continue to decline (i.e., rising PE ratios) even as bond yields flatten or begin to rise. Equity prices continue their slow upward march, climbing a major wall of worry that is fading away (e.g., Greek defaults, collapsing oil prices, Ukraine tensions, Fed tightening). 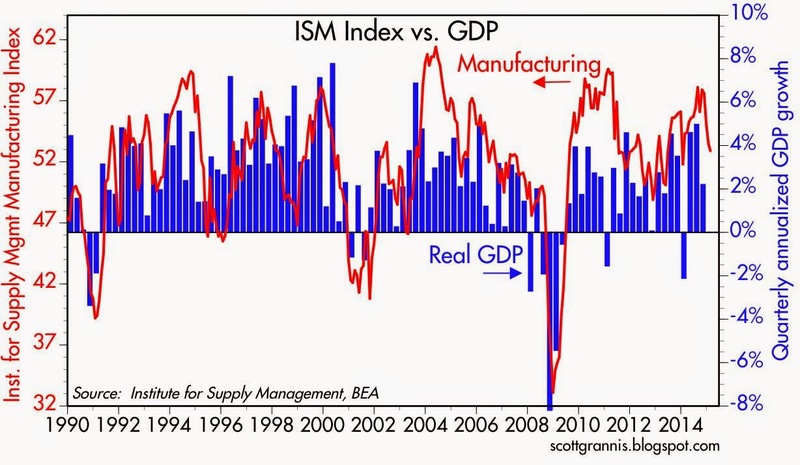 The February ISM manufacturing index was about as expected. 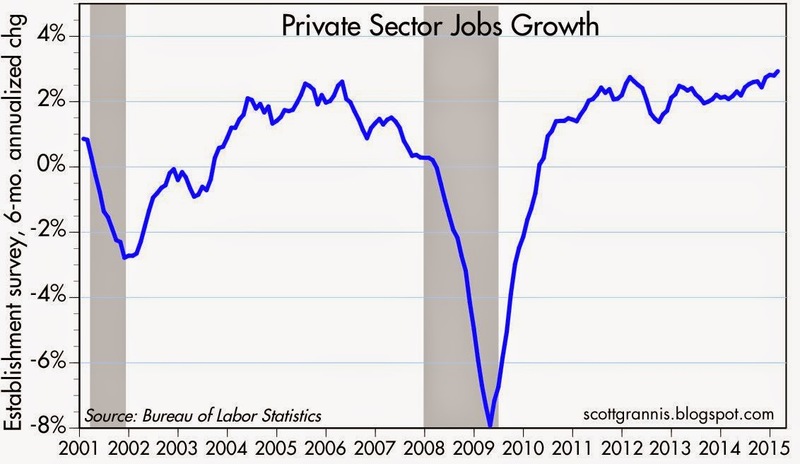 Although it's off quite a bit from its recent highs, it is still consistent with overall economic growth of 2-3%. The economy has been doing a bit better over the past year, but it's nothing to get excited about. The outlook for growth remains moderate; not great, but not bad either, with some modest improvement on the margin. Significant improvement will come when and if fiscal policy becomes more growth-friendly (e.g., lower and flatter tax rates, especially for corporations, and reduced regulatory burdens). 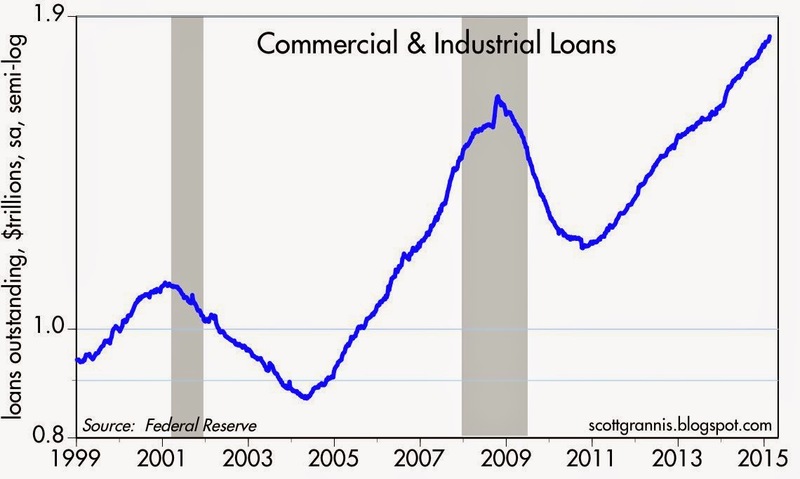 One of the more encouraging developments in the past year is the pickup in C&I Loans. 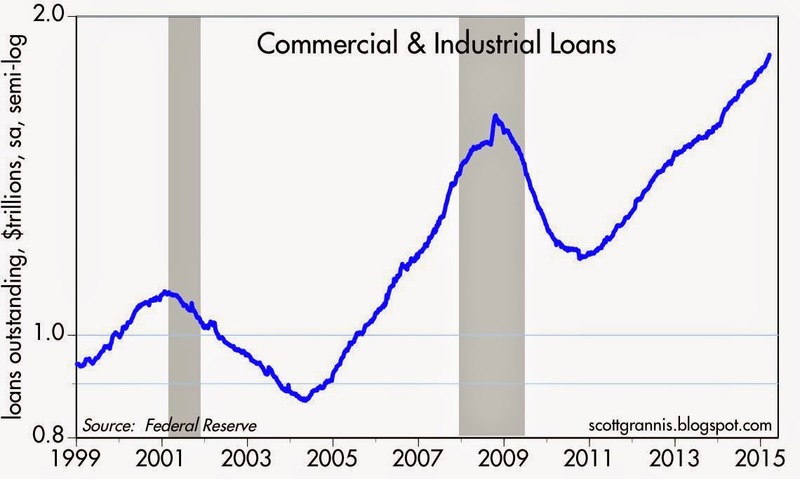 This reflects increased confidence on the part of banks and businesses—banks are more willing to lend, and businesses are more willing to borrow. 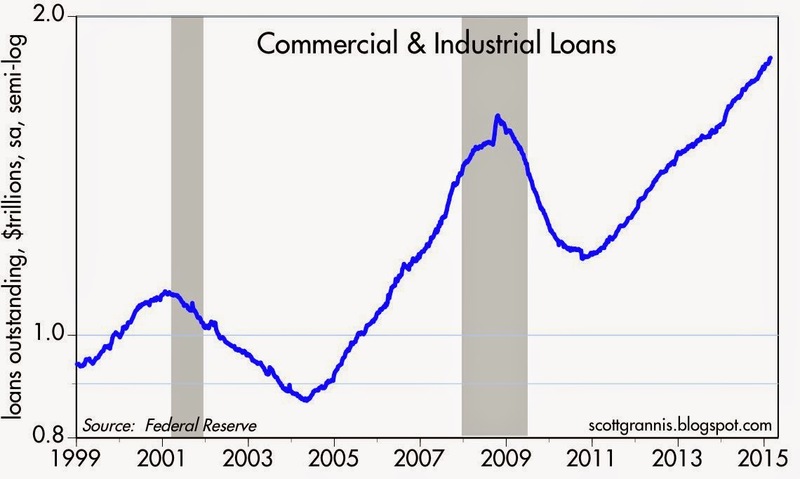 Bank lending to small and medium-sized businesses is growing at a solid 12% annual rate these days. The increased confidence this reflects lends solid support to a forecast of continued economic growth. 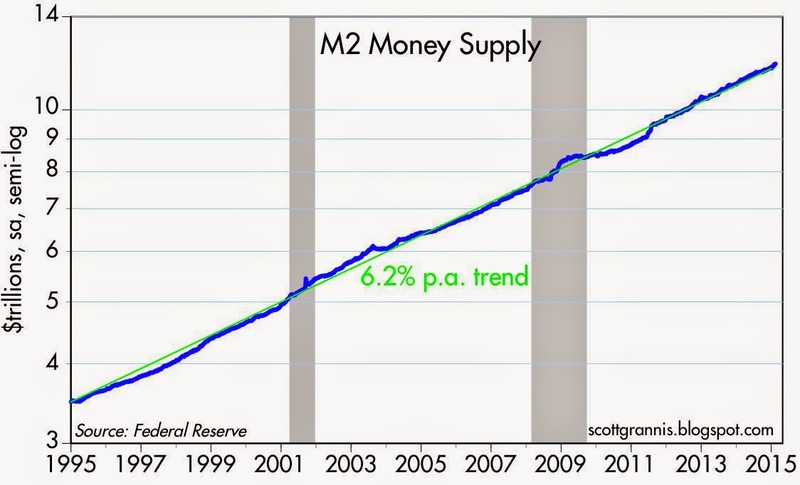 Money supply growth has averaged just over 6% per year for the past 20 years. 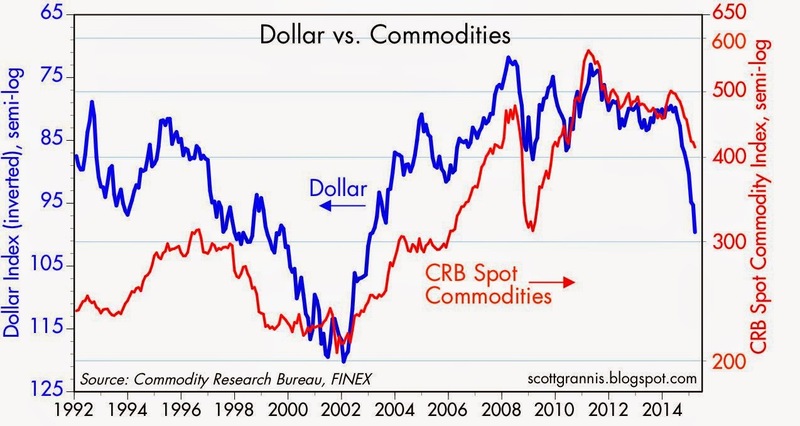 No sign here of the Fed "printing money" in any unusual way. However, nominal GDP growth has averaged 4.4% over this same period. When money growth exceeds nominal GDP growth, we can infer that the world's demand for "money" has increased; people want to increase their money balances relative to their incomes, usually out of a desire to reduce risk. 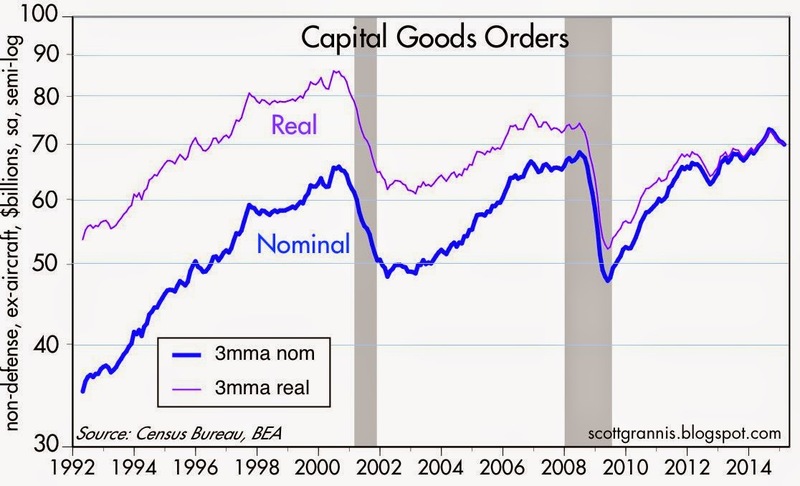 Demand for money (i.e., the ratio of M2 to nominal GDP) has risen strongly over the past 20 or so years, especially since the Great Recession. 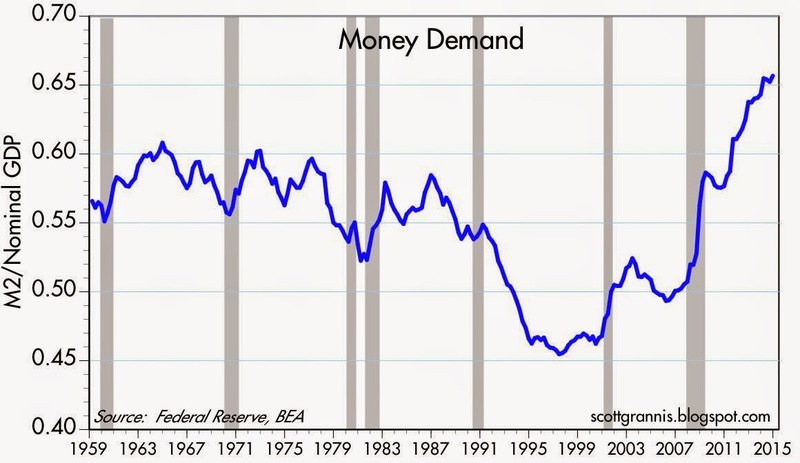 But the rate of increase in money demand is slowing, as risk aversion declines. Rising money demand was the major impetus for the Fed's Quantitative Easing, whose major purpose was to "transmogrify" notes and bonds into T-bill equivalents (bank reserves). 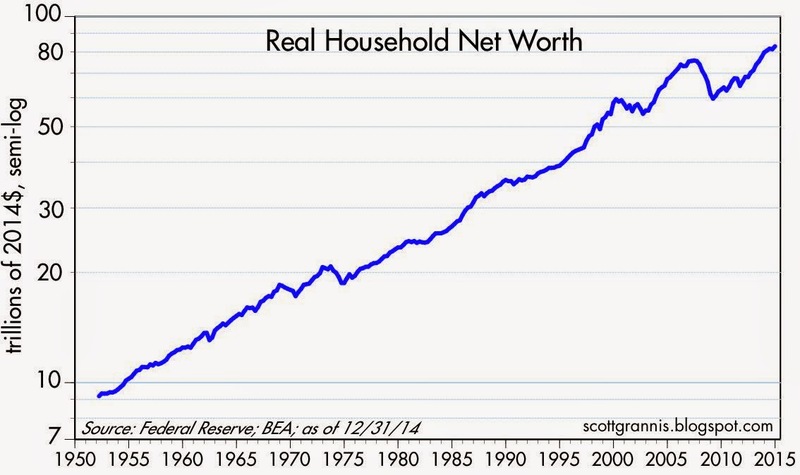 The world wanted a lot more safe assets, and QE generated over $3 trillion of safe assets to meet that demand. 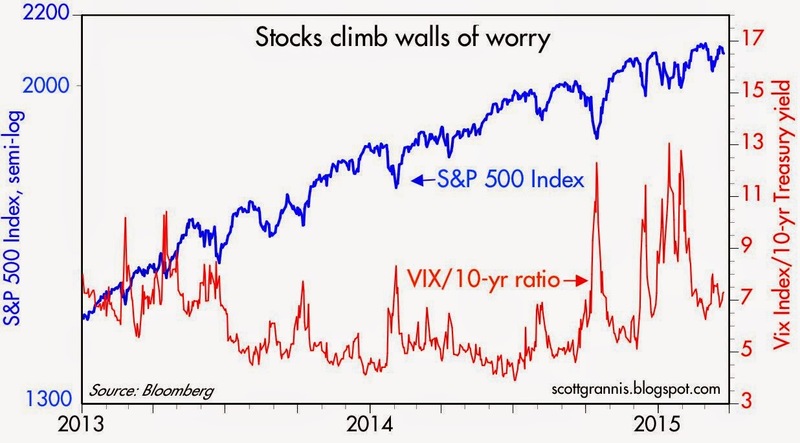 As risk aversion declines, QE is no longer necessary. 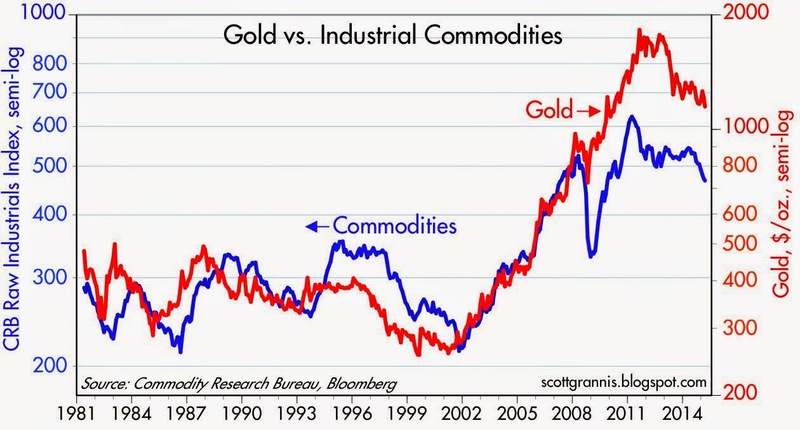 The important thing to watch for is a decline in money demand. 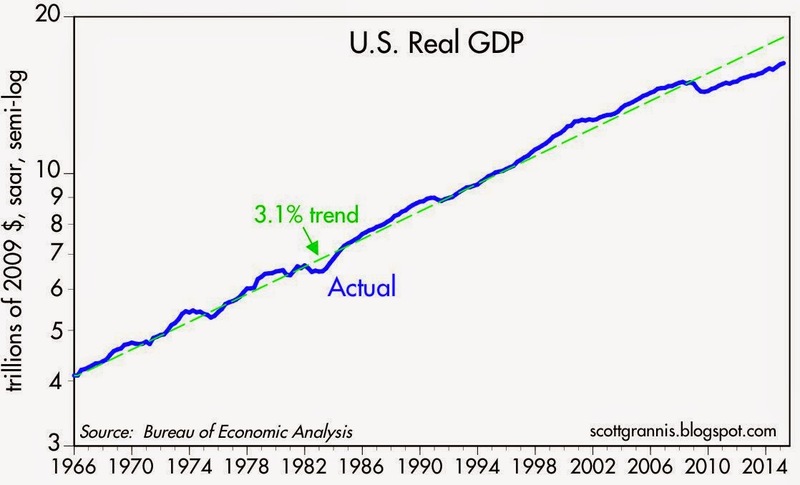 It's been a long time coming, but sooner or later we are likely to see nominal GDP growth exceed M2 growth. That time will most likely coincide with rising confidence, a stronger economy, and a tendency for rising inflation. This will test the Fed's ability to keep the supply and demand for money in balance by increasing short-term interest rates. 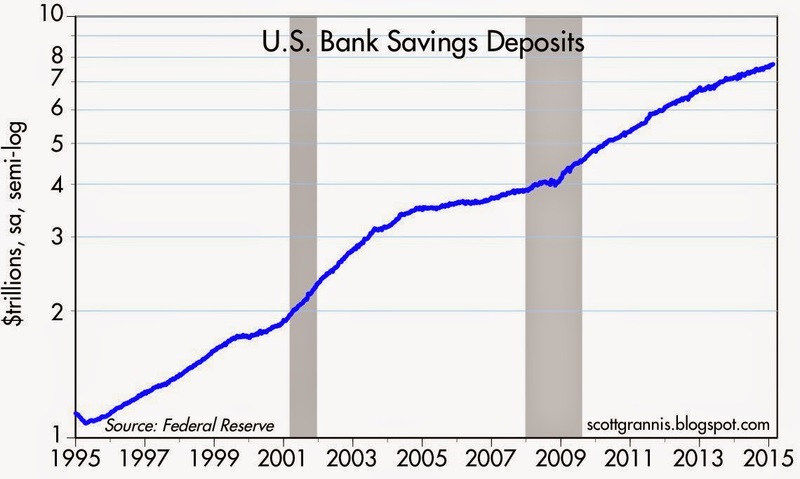 The main source of M2 growth since the Great Recession has been bank savings deposits. 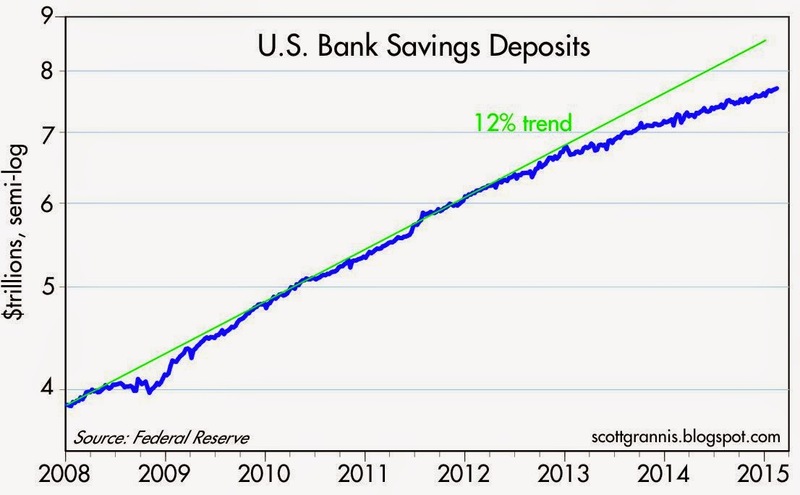 Note the slowing in the growth rate of savings deposits that began about two years ago. 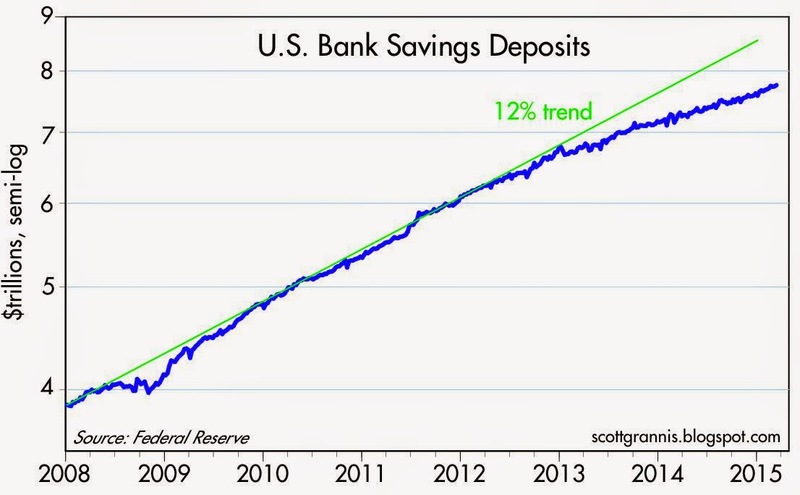 Savings deposits were growing about 12% per year, but have only grown at about 6% over the past year. This growth slowdown is likely to continue, as households become less interested in accumulating savings deposits that pay almost nothing in a world in world in which stocks rise 1% a month, earnings remain at record levels, and inflation is at least 1-1.5% a year and rising.